Idiot Savant at No Right Turn is at least being consistent opposing Saddam getting the death penalty. 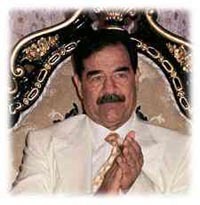 On top of that he says “Unlike the Nazis, Milosovic, or the genocideres of Rwanda, Saddam did not receive a fair trial according to basic international standards”. I simply do not care – it is beyond any doubt that Saddam was responsible for waging war and engaging in mass murder. He is not a private citizen and does not deserve the treatment of one. I do not want him imprisoned - largely because so many dictators in the past have been imprisoned and over time find their way into other countries or living a sheltered existence, as new governments are too weak to take them on. Pol Pot, Idi Amin and Bokassa among others should all have been put to death. I cannot conceive how any human being with an ounce of decency can give a second of consideration as to what happens to that monster. It is not a precedent for hanging murder suspects high - it is of a different scale. The leader of a totalitarian state is a slavemaster who commands life or death upon his subjects - this is supremely despicable beyond words, and well beyond that of an errant citizen who commits murder in an otherwise free society. Robert Fisk decries it because Iraq was a US ally in the 1980s. Well it was also a Soviet ally too, but you wont see Fisk damning Russia because the Soviet government is “gone”. The fact that the current US administration is three removed from the one at the time of Saddam’s crimes is irrelevant. Fisk points out that the US turned a blind eye when Saddam used chemical weapons in Anfal and in the war against Iran. Saddam’s war against Iran was supported by the US, UK, France, West Germany and the USSR – in other words, it had widespread support by the international community, against the Islamist regime in Iran. The west chose Iraq as a lesser threat – a point that may yet prove to have been true. Fisk ignores that most of Iraq’s weapons were acquired from the USSR, other Warsaw Pact countries and China in the 1980s – he wouldn’t dare damn them would he? You see Fisk likes applying moral equivalency to the USA over Saddam Hussein and anyone who thinks that this is justified needs their heads read - only a fool would say that the two administrations are morally equivalent. Life, liberty and the pursuit of happiness. Politics, philosophy and economics from a pro-capitalist, libertarian, objectivist perspective. Born in New Zealand, live in the UK, career has been in transport, telecommunications and infrastructure policy. Korea: Real change or the cycle of bluff? So why is China upset about Taiwan? Trade Deal: Will The Markets Sell The News? Mana Party - Marxism, racism, but it's cool because it's Hone? NZ Act Party - A liberal party led by a conservative Christian. Really! So you think you pay for government? What to do in the US? Are green taxes a good idea?